Update: Speaking on state TV a day after the alleged assassination attempt on Maduro, Interior Minister Nestor Reverol said that six people have been taken into custody and more arrests are possible in the coming hours. He also said that two drones carrying 1 kg each of C-4 explosive were "disoriented" by govt. signal blockers. He added that the government has raided several Caracas hotels in search for evidence, and noted that one suspect linked to a 2017 attack on Carabobo military base, another to last year’s anti-government protests. Meanwhile speculation that this was just another false flag attack to build popular support for Maduro's crumbling regime, continues to grow. Was it a gas cylinder explosion? An assassination plot of US-allied groups? Or possibly the unheard of “National Movement of Soldiers in T-shirts” that are now claiming responsibility? And where are the remnants or debris parts to any drones that may have been exploded, or possibly even live iPhone footage (though iPhones have been hard to come by in socialist Venezuela over the years) of drones overhead shot by any one of what appears to have been tens of thousands attending the event? It seems the more details that come out surrounding the apparent drone assassination attempt of Venezuelan President Nicolas Maduro on Saturday afternoon, the stranger and more ambiguous it gets in terms of exactly what happened and who is responsible. For starters on Sunday morning US National Security Adviser John Bolton addressed charges of potential American involvement head on, telling Fox News Sunday host Chris Wallace, "I can say unequivocally there was no U.S. government involvement in this at all". This followed a speech by Maduro in what was his first formal statement since the incident wherein the controversial left-wing Venezuelan president described, “They tried to assassinate me today," while blaming the attack on right-wing factions specifically connected to Columbia and Florida. He claimed that "several of those intellectually responsible and the financiers of this attack live in the United States, in the state of Florida," and called on U.S. President Donald Trump to "fight these terrorist groups". Maduro further related that one drone exploded in front him, with seconds later another blast detonating to his right. “That drone was coming for me but there was a shield of love,” Maduro said. 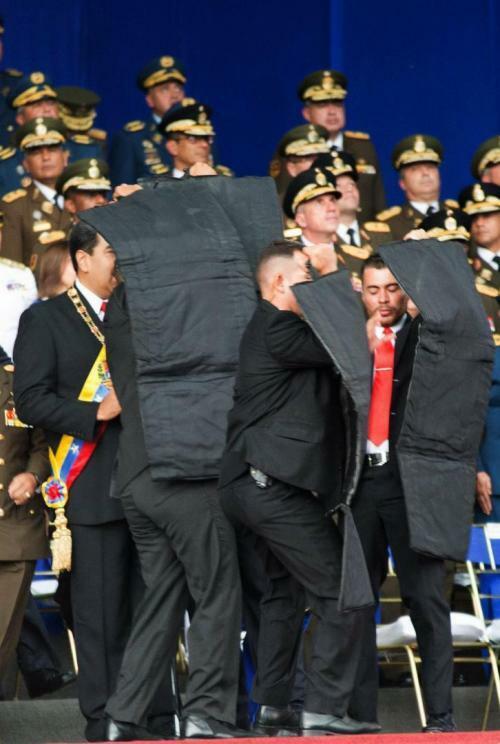 Indeed a live feed showing Maduro speaking at a large army commemoration event in the capital of Caracas was cut off mid-speech as explosions were heard, and body guards immediately shielded the president with bullet proof coverings, after which soldiers can be seen running in disarray before the transmission ends. Neither President Maduro nor his wife or government ministers sharing the stage with them were reported injured, and they express what appears to be genuine shock and fear when the blasts went off. Photographs depicted at least one possibly seriously wounded soldier with blood running down his face, and Venezuelan state sources reported that a total of seven National Guard soldiers were injured. In response to these accusations, Bolton elaborated during his Fox interview, saying, "If the government of Venezuela has hard information that they want to present to us that would show a potential violation of U.S. criminal law, we’ll take a serious look at it, but in the meantime I think what we really should focus on is the corruption and oppression in the Maduro regime in Venezuela." President Trump was promptly briefed on the incident Saturday evening prior to a rally in Ohio, according to White House statements. And in what could constitute among the more bizarre twists in an already incredibly strange story, an obscure and relatively recently established "resistance" group calling itself the "National Movement of Soldiers in T-shirts" (Soldados de Franela) claimed responsibility for the targeted assassination attempt in a series of social media posts. The group claimed it flew two drones toward the president, which it says were shot down by snipers. “We demonstrated that they are vulnerable. We didn’t have success today, but it’s just a question of time,” wrote the group. Among the alternate narratives that quickly emerged moments after the attack was that a gas explosion occurred in a nearby residential building. 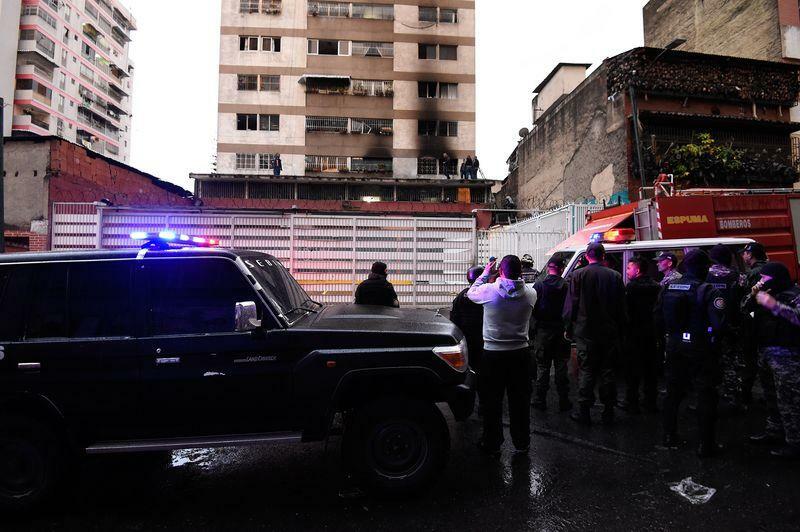 Video footage and photographs showed a nearby apartment building on fire, which Venezuelan and other sources said was caused by one of the drones crashing into it. According to a local citizen interviewed by Reuters, there were two distinct blasts. Yet thus far there hasn't been any cell phone video or photographic evidence to emerge depicting what the Venezuelan information ministry described as "drones loaded with explosives" that targeted the downtown area. Meanwhile, responding official Venezuelan statements suggesting Columbian involvement, the Colombian Foreign Relations Ministry said the charge is “absurd” and without basis: “We’re used to the Venezuelan leader constantly accusing Colombia for any sort of situation,” the ministry said in a late Saturday night statement.